Witch-hunt says Congress, Adarsh-2 says BJP. What's the story behind #NationalHerald plot in Bandra? What are the alleged irregularities? What is the Congress\' explanation? No matter how hard they try to get it off their neck, the National Herald albatross continues to hang over the Congress party and its top leadership. Even before the party could set the record straight on the summons issued by Delhi Sessions Court against its president Sonia Gandhi and vice-president Rahul Gandhi, its Maharashtra unit has been put on the defensive regarding change of land use for a plot allotted to Associated Journal Limited (AJL) at Bandra. A number of alleged irregularities related to AJL, that owned National Herald, have started tumbling out of late. First the Haryana government decided to conduct an inquiry into allotment of a plot to AJL at Panchkula. Now, the Maharashtra government has ordered an inquiry into an allegedly illegal change of land use for the Bandra plot. This couldn't have come at a worse time for the party as its state leaders had been preparing to corner the state government on issues like farmer suicides, loan waivers and the deteriorating law and order situation. The change of land use for the plot was revealed through an Right to Information query filed by activist Anil Galgali. "Initially the plot was allotted to AJL to construct the Nehru Memorial Library. However, the No Objection Certificate issued by Fire Department of Brihanmumbai Municipal Corporation (BMC) refers to the structure as Congress Bhavan, and there is no mention of the library anywhere in the NOC," Galgali said. The proposed Nehru Memorial Library is now Congress Bhavan, an 11 storeyed building that is under construction. Apparently, the 3478.40 sq mt plot at a prime location in Bandra, was allotted to AJL in 1983 to construct Nehru Memorial Library. "Surprisingly, the NOC issued by the fire department has no mention of Nehru Memorial Library. The said construction is referred to as Congress Bhavan. This is a serious violation and needs to be investigated thoroughly," Galgali said. It is learnt that the plot, along the Western Express Highway was allotted to AJL to construct a printing press for its newspaper National Herald and the Nehru Memorial Research Centre and Library. However, the land use has now been changed to a commercial building. It is alleged that according to the plan, the building will house shops and other commercial enterprises. Meanwhile, the Congress party has denied the allegations and said that this is nothing but a witch hunt. "The government is creating an issue out of nothing. The BJP led state government is just trying to divert public attention from its own failures," said Congress spokesperson Sachin Sawant. Also read - National Herald case: where did the Gandhis go wrong? He further denied any irregularity stating that the building is still under construction. "The building is still being constructed. How can the government allege that there won't be a library or a printing press there? They should have waited till completion of the construction before taking any decision. This is nothing but an effort to defame the Opposition," Sawant said. "The plot was allotted to AJL more than 3 decades ago, for construction of a printing press for National Herald and the Nehru Research Centre and Library. There was no activity for 3 decades. All of a sudden the construction work for this 11 storeyed building began on the plot. This was shocking. When I sought details of the proposed building from the civic authorities, the truth was revealed," Galgali said. In its reply to the RTI query filed by Galgali, BMC informed that the due No Objection Certificate (NOC) was given for the construction of a 'high rise commercial building' on the plot. However, BMC's fire department had a different tale to tell. 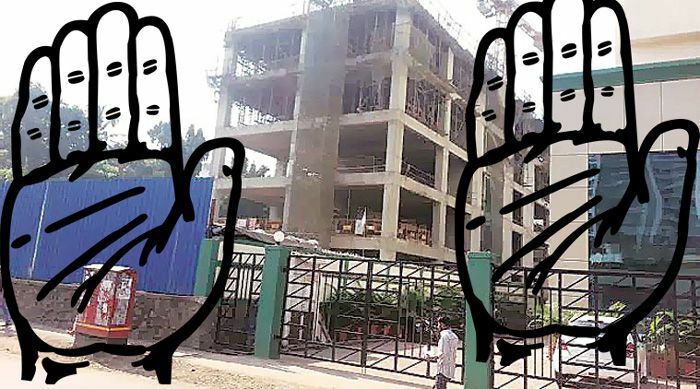 "When the details of Fire Department NOC to the said building were sought, the department replied that the NOC was issued for construction of Congress Bhavan. The difference in the replies by the two departments creates great scope for irregularities," Galgali said. Naturally, the row has come a shot in the arm for the BJP. "The matter is as old as the Adarsh Cooperative Housing Society scam. When the Adarsh scam surfaced over 5 years back, the issue of this plot in Bandra too, had cropped up. The complaints about irregularities were filed 5 years back. Now it is nothing but an afterthought to blame us for taking action," BJP spokesperson Madhav Bhandari said. He alleged that it was criminal to build a commercial building in the guise of a newspaper printing press and research centre. Galgali claims that the irregularities are not limited to change of land use. "The land was allotted to AJL in 1983 for Rs 1.31 crore. There was a condition that construction of proposed newspaper press and research centre shall commence within 3 years of the allotment, and the entire amount was to be paid in one installment. Both these conditions were violated and the authorities turned a blind eye to it," he said. He alleged that the interest on the unpaid amount was to the tune of Rs 2.69 crore, which was waived by the then Revenue Minister Ashok Chavan. Apparently, the plot was originally reserved for a hostel for SC/ST students. "The AJL, managed to hold on to the plot and get the lease extended for 30 years. Now, the current lease expires on 22 December. The government must take the matter to its logical end and punish the guilty," Galgali said.